You undoubtedly encounter a wide range of people on the job, some of whom are easy to get along with and others you want to avoid at all costs. It’s only human nature to avoid contact with people whose personality traits set your teeth on edge, but there is one type of person who cannot safety be ignored: a co-worker who verbally or physically threatens others. In the aftermath of a violent incident, it’s not uncommon for people to say that the person who harmed others was a time bomb waiting to explode. The question here that begs an answer is: why would people do nothing and wait for that to happen? Take verbal threats seriously. All threats should be reported to security or the appropriate manager. Report any suspicious person or vehicle to security personnel, especially at night. The suspect could be casing your workplace for a break-in. Or the person could be stalking someone at your workplace. Watch for unauthorized visitors who seem to have legitimate business at your plant. Crimes have been committed by people posing as employees, contractors and repair persons. Always wear your identification badge at all times. Observe your company’s rules prohibiting drugs and alcohol at work. Many violent incidents at work can be traced to the use of these substances. Learn how to contact help in an emergency. Speed-dialing numbers should be programmed into phones and emergency numbers should be listed at each phone. Adopt some distress signals, including predetermined code words that can be used to alert other workers to dangerous customers or visitors without tipping off the suspect. Act on your instincts. If you sense something is wrong, report it. Pick fights. 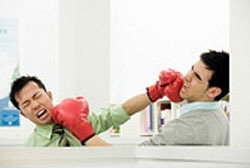 Loud and aggressive arguments can easily escalate into physical fights. Pick up hitch-hikers under any circumstances if your job involves driving. The most important reason for this rule is your personal safety. Ignore threats or disturbing changes in a co-worker’s behavior, such as an obsession with weapons or violence or someone talking about a "hit list" of co-workers he or she would like to see dead. One’s personal security, whether on or off the job, can never be guaranteed. However, the risks can be greatly reduced by having a plan and reacting to warning signs. For more information contact the knowledgebroker John Brengosz.